Ever since I was bitten by the rock bug, people have been giving me stones (and, increasingly, rusty bits of metal) to use in my mosaics. Sometimes it’s a negotiated exchange (“I’ll send you some of mine if you send me some of yours”), sometimes people are lovely enough to think of me while they’re travelling, sometimes rocks pass through many hands before I get them (like the chunk of quartz that was from my mom’s friend’s friend), and sometimes the rock fairy just randomly shows up at my office (which ends in me going around the floor, checking with the usual suspects to see whether they were responsible for whatever goodies were left on my desk). It’s always interesting to see what other people think will be perfect for incorporating into my work. The rocks that non-mosaic people give me are usually much different than what I would normally pick up—they tend to be rounder, smoother, and typically more aesthetically pleasing or interesting as is (think of the souvenir rocks you squirrel away in your pocket on vacation and then promptly forget about)—as opposed to the usual “workhorse” rocks that I pick up with the intention of smashing to bits. That said, I eventually find a use for the vast majority of them, which is neat because it forces me to push myself a little bit and consider new possibilities. I also love that these rocks almost always come with stories, whether spoken or unspoken, and I enjoy knowing that people have connected with them in some way—in a particular place and at a particular moment in time—before they give them to me. I have also loved putting together packages of rocks that I’ve sent off to mosaic pals and sharing a little bit of home with them. It’s fun to think that the rocks I think are perfect aren’t necessarily the ones that they’d choose for themselves, even if we both make mosaics. While I may occasionally get stumped—damn you, large, perfectly round rock, you will not defeat me!—I always love it when the rock (or rusty metal) fairy visits. I get a warm fuzzy feeling when non-mosaic people go out of their way to indulge my habit, and there’s a sense of kinship, community, and connection when fellow mosaic people swap rocks with me. Either way, the rock fairy is always welcome at my place! It seems that when friends and family get married, having me make a mosaic for them is a popular request. This particular wedding gift mosaic was for R’s brother and his wife, which R commissioned me to do (although I have yet to see the pay cheque…). The bride and groom gave me a list of earlier pieces of mine that they enjoyed, but essentially gave me free rein in terms of design, colours, and materials. Since the “Mississippi Meander” was on their list, I decided to go with a river theme. I’ve been planning to build a series around rivers for a while now, so this was a good chance to start doing that. I chose a section of the Grand River that runs through Kitchener (where they live) and then stretched it to cover the substrate I was planning to use, so it’s definitely a loose interpretation of that part of the Grand. Originally, I had wanted to get rocks from their area to use, but time did not permit; instead, I used ones I had gathered here in Ottawa. I absolutely love the grey pieces that have lines in them and the ones that have a bit of orangey-brown at one end. It was weird working on a project and not being able to post pictures / updates. I kept wanting to tell people (and by people, I mean Facebook): “I’m working, really I am! You just can’t see what I’m working on!” But now the mosaic – which I named “River bend” – is in their possession, so I can safely share pictures of it with you without ruining their surprise. Phewf! Dexter likes to help out when I’m taking pictures. He’s oh so helpful. Mine came together fairly quickly because I used fairly big pieces of glass, but R was a bit more ambitious. There were a few cut fingers (mostly mine), more than a few expletives uttered out of sheer frustration (mostly hers), and 2 sore necks from bending over our projects for hours. Yes, it was a veritable Christmas mosaic sweatshop over here. Oh, and wouldn’t you know it, she hates the grouting and polishing too, so guess who got stuck doing that! I think R did a fabulous job on her mosaics, especially considering it was her first time – she’s got a great eye (not that I’m biased or anything). I also found it really interesting to see how different our styles were. My brother’s fiancée is a huge Nightmare Before Christmas fan. We’re talking huge fan – she’s got more Nightmare paraphernalia than Ottawa has civil servants. So this year I decided to contribute to her collection by making her a Jack mosaic. 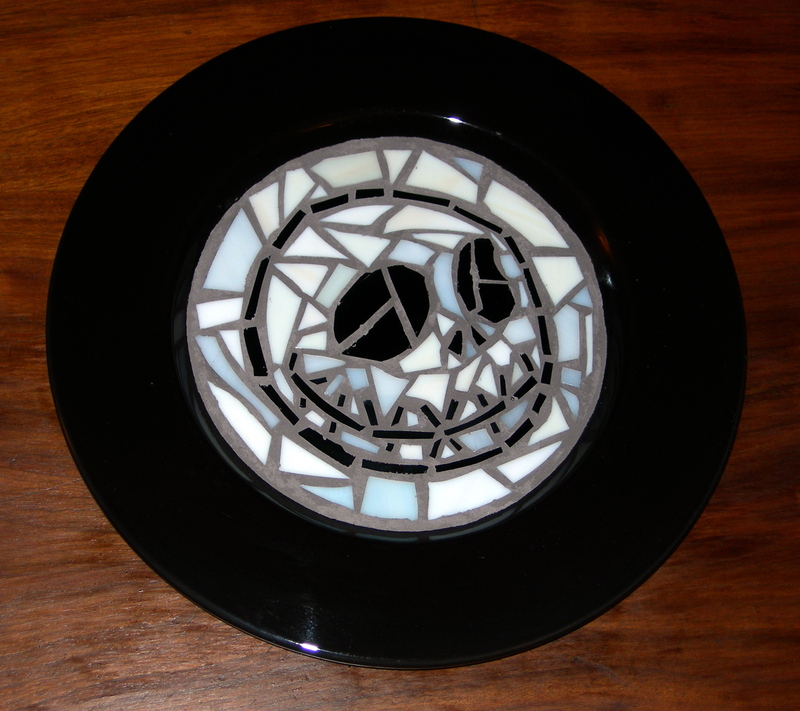 I chose the simplest design I could find, and even once I got it drawn on the plate I had to simplify it even more – Jack’s mouth just had way too many lines! Damn him! Even though this piece was a bit of a challenge, it did have one advantage: if I can’t come up with any gift ideas for her next year, I can always follow up with a Sally mosaic! My first multi-sided project was a vase, which was, of course, let’s say it all together: sans lip. Oh boy. By the time this project rolled around, I had finally bought my very own glass cutter and I was itching to use it. The pieces fit together pretty quickly without much cutting required, and my new glass cutter sat idly by, giving me sad, lonely, longing looks. Poor fella. Grouting proved to be even more “fun” than usual, because the grout didn’t really want to stick to the glass base. Grrrrr. Anyway, I kept at ‘er and the final product provoked a bidding war on Facebook – my first bidding war, how exciting! In the end, my best friend won out and this little guy now resides in her living room. Next on my list of projects was a small mirror that I made as a wedding present for a friend. It was quite a change going from doing 2 big tables to doing a small mirror. I was used to having lots of room to play with the glass, and now I felt a bit constricted. Choosing the colours is always tough, but it was especially difficult in this case because I couldn’t remember what colour scheme my friend had in her house. Thankfully I lucked out and red was a perfect choice! Other than that, there’s not much a story behind this piece, I’m afraid. My apologies for the rather ghetto-looking picture – back then, I was still kind of learning how to photograph my mosaics. The 2 nice pictures of my tables (as seen in my previous 2 posts) were taken years later, after I had finally figured out how to take a good picture of a piece – the original pictures of the tables were every bit as painful as this one. Alas, there was no “do over” option for the mirror since it has long been out of my possession. Seriously though, who picks an afghan as a nice, sophisticated yet simple background?? Sheesh. Highly embarrassing.